Looks like we can pin another "unintended acceleration" incident on a confused driver with an automatic transmission. 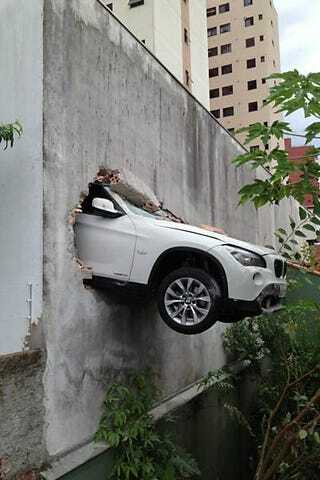 The driver of this BMW X1 crashed her SUV through a concrete wall in a parking garage in Blumenau, Brazil today, according to Sao Paulo's Folha newspaper. Luckily, she apparently was not injured. A winch was used to remove the SUV from the hole in the wall after she crawled out the back. How did this happen? A neighbor explains that she put the car into drive instead of neutral, and when it started moving, she panicked and hit the gas pedal instead of the brake. "She is an old lady and not used to the new car with automatic transmission," the neighbor told the newspaper. This probably wouldn't have happened if the Bimmer had a stick. Just sayin'.